Giovanni Carlucci first appears in the Painesville, Ohio, area in 1940. 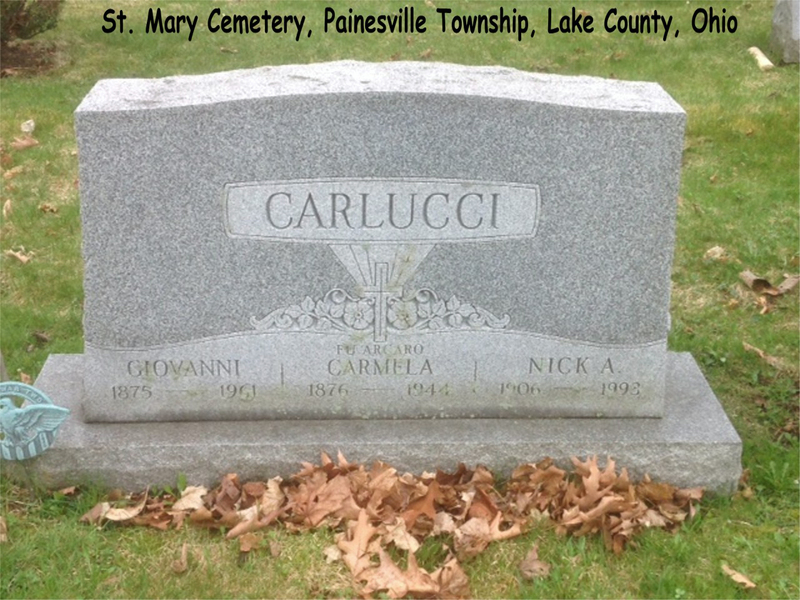 He moved to Painesville to live with his son, Nicola Carlucci. Giovanni Carlucci was born in 1875, at Sant’Angelo in Grotte, Italy. He married Carmella Arcaro in Italy. Giovanni died on March 11, 1961, at Conway Rest Home, Madison, Lake County, Ohio. His body was interred at St. Mary Cemetery at Painesville Township, Lake County, Ohio. Giovanni Carlucci first immigrated to the United States about 1906. He established residence in Painesville, Ohio, in 1940, after retiring from the Albany Railroad. At the time of death, Giovanni resided with his son at 61 Sanford Street, Painesville, Lake County, Ohio. 1. Michael Carlucci. Place and date of birth unknown. 2. Nicola Carlucci was born on May 22, 1906, at Italy. He married first, Caroline M. Notte, daughter of Michele Notte and Filomena Zappitelli. He married second, Regina Tawneyk. Nicola died on December 15, 1993, at Greenlawn Nursing Home, Concord Township, Lake County, Ohio, at age 87. His body was interred at St. Mary Cemetery at Painesville Township, Lake County, Ohio.